Still throwing your egg yolks away – wake -up! Once upon a time, the egg yolk was the premiere boogeyman of the nutritional world. No more! Here’s what you need to know about using yolks to get yoked.People around the world prepare eggs in countless ways. Scrambled and fried are just the start. But nothing cooked them more than the barrage of attacks laid out by the health industry throughout the 1970s, ’80s, and ’90s. And the most villainized part of the egg, of course, was the yolk. But after years of abuse, the future is looking sunny-side up for that little yellow orb. Recent research has shed further light on the health benefits of whole eggs and cast plenty of doubt on the biggest arguments against the yolk. Let’s crack open the discussion! For years, the media and health-governing bodies issued warnings to avoid saturated fat at all costs because it was thought to be a major player in increasing one’s risk for cardiovascular disease. 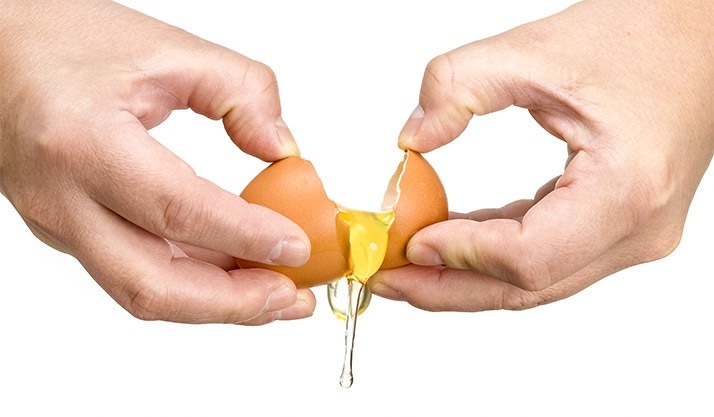 Eggs, which happen to contain saturated fat in the yolk, were a primary target. “Only eat eggs twice per week” and “never have more than two eggs a day” were common guidelines. DON’T SKIP THE YOLKS OUT OF FEAR OF WHAT THEY MIGHT DO TO YOUR HEALTH DECADES DOWN THE ROAD. In either case, one large egg contains less than 10 percent of the recommended daily amount of saturated fat, and the last time I checked, that’s not even close to the biggest source around.4 But let’s look more closely at saturated fat in general. The reason saturated fat got such a bad rap was because of its supposed effect on cholesterol. Chronically elevated cholesterol, in combination with other cardiovascular disease risks, such as a sedentary lifestyle, diabetes, poor dietary choices, and high blood pressure, has been linked to various forms of heart disease. In fact, cholesterol is important—in the right amounts—for the avid gym-goer looking to improve his or her performance and physique. Why? Cholesterol is a precursor for testosterone, which, as we all know, has a profound impact on supporting and facilitating gains. IN ADDITION TO BEING A PROTEIN POWERHOUSE, EGGS ARE JAM-PACKED WITH A RANGE OF CRUCIAL NUTRIENTS. HOWEVER, BY THROWING OUT THE YOLK, YOU’RE LOSING OUT ON NUMEROUS VALUABLE NUTRIENTS. The real question, of course, is how all the saturated fats in foods like yolks potentially contribute to disease, right? A 2015 systematic review published in the British Medical Journal looked squarely at this association, including cardiovascular disease (CVD) and type 2 diabetes.2 Researchers concluded that “saturated fats are not associated with all-cause mortality, CVD, coronary heart disease, ischemic stroke, or type 2 diabetes.” Dozens of other studies have backed this up. The takeaway: Don’t skip the yolks out of fear of what they might do to your health decades down the road. As long as the fitness industry has been around, eggs have been considered a go-to protein source. In the 1960s and 1970s, larger-than-life characters like Arnold Schwarzenegger and Sylvester Stallone’s Rocky Balboa went the extra mile and guzzled them raw. In addition to being a protein powerhouse, eggs are jam-packed with a range of crucial nutrients. However, by throwing out the yolk, you’re losing out on numerous valuable nutrients. 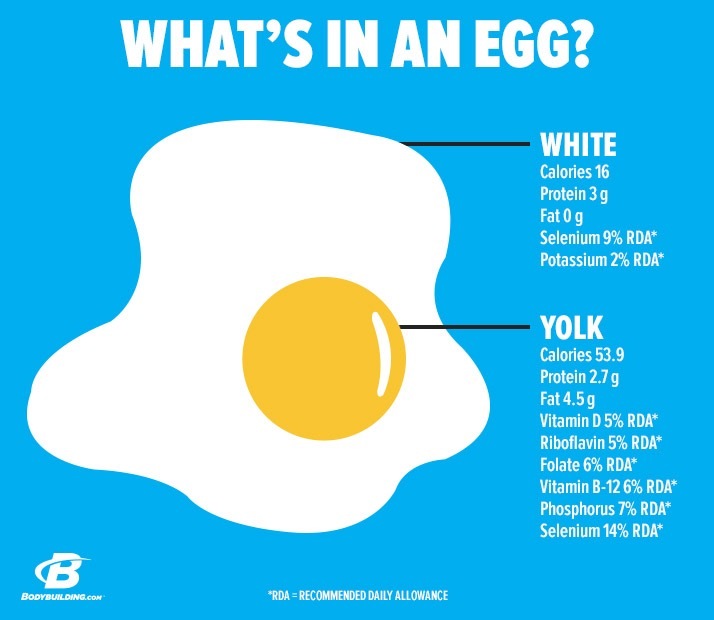 Let’s take a look at the differences between the egg white and the yolk. It’s basically water, protein, and a couple of nutrients in small amounts. Choline: Choline is an essential vitamin-like nutrient that plays a number of important roles within the body, including the production of the crucial neurotransmitter acetylcholine. Choline is also a major player in lipid metabolism and helps to increase neurotransmitter production.7 It just so happens that eggs are one of the best sources of choline. Vitamin D: This fat-soluble vitamin offers far too many health-supporting and muscle-building benefits to list here. Unfortunately, it’s hard to find in food sources without enrichment.8 For this reason—and because we don’t get enough time in the sun—deficiencies are rampant, which can have serious health implications, particularly on the immune system. Egg yolks won’t solve the problem on their own, but they’re an important part of a multifaceted approach. Additional fat-soluble vitamins: Egg yolks are also a solid source of vitamins A, E, and K, all of which require adequate dietary fat for absorption. You’ve no doubt heard that taking your daily multivitamin with a meal is a great way to optimize absorption. Yolks are like a multivitamin all on their own—or a great way to make sure yours is working. If building muscle is your goal, including the yolks is a no-brainer. Whole eggs are rich in leucine, have a rock-solid amino-acid profile, and are about as affordable a superfood as you could ever hope to find. As for those extra calories, well, you’ll need them if you want to add muscle. 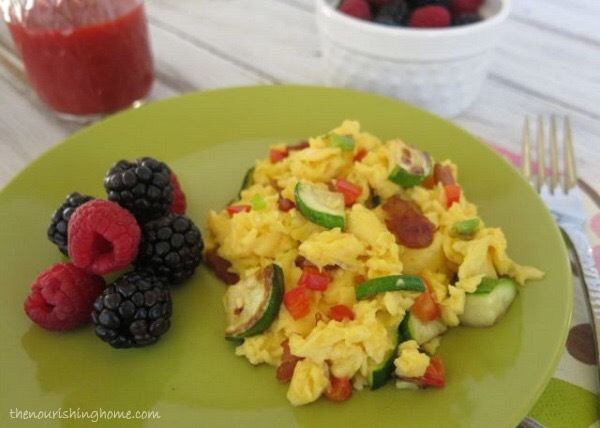 Whether whole eggs can help you lose weight is a question I’ve heard many times. The answer isn’t a simple “yes” or “no.” To be clear, the deciding factor in your weight-loss journey is whether or not you’re eating a variety of nutritious foods while in a caloric deficit. There is a case for whole eggs, though. Consuming more fat has been shown to help keep dieters feeling full longer than a diet low in fat, while also optimizing their hormonal profile. Going very low-fat, we now know, is a bad idea for multiple reasons, and can leave you feeling awful. DON’T CUT YOLKS OUT ON ACCOUNT OF THEIR FAT. AS FOR THEIR EXTRA CALORIES, WELL, IF YOU’RE SKEPTICAL, YOU CAN ALWAYS OPT FOR A HALF-HALF MIXTURE OF WHITES AND WHOLE EGGS. So don’t cut yolks out on account of their fat. As for their extra calories, well, if you’re skeptical, you can always opt for a half-half mixture of whites and whole eggs. But here’s what will always be in favor of eggs: They’re just easy. Making a fast, egg-based breakfast in the morning is simple, satisfying, and can be matched to just about any palate. My advice? Don’t be chicken about eggs, so long as they fit your macros. The biggest choice now is how you want ’em made. de Souze, R.J., Mente, A., Maroleanu, A., Cozma, A.I., Ha, V., Kishibe, T., Uleryk, E., Budylowski, P., Schunemann, H., Beyene, J. & Anand, S.S. (2015). Intake of saturated and trans unsaturated fatty acids and risk of all cause mortality, cardiovascular disease, and type 2 diabetes: systematic review and meta-analysis of observational studies. The British Journal of Medicine, 351. doi: 10.1136/bmj.h3978. Dietary Guidelines for Americans, 2010. U.S. Department of Health and Human Services. http://www.cnpp.usda.gov/DGAs2010-PolicyDocument.htm. Accessed Sept. 12, 2013. McCaffery, J. M., Pogue-Geile, M. F., Muldoon, M., Debski, T. T., Wing, R. R., & Manuck, S. B. (2001). The nature of the association between diet and serum lipids in the community: A twin study. Health Psychology, 20(5), 341. Egg Nutrition Council. (2014). Position Statement for Healthcare Professionals: Eggs and Protein. http://enc.org.au/position-statements/eggs-and-protein/. Zeisel, S.H. & Corbin, K.D. (2012). Choline. Present Knowledge in Nutrition. John Wiley and Sons. 10th Edition, 405-418. Hamilton, B. (2011). Vitamin D and Athletic Performance: The Potential Role of Muscle. Asian Journal of Sports Medicine, 2(4), 211-219. ← Half the UK Too Tired to Train!